SINSINAWA, Wis.—Artist David Mngodo of DeForest, Wis., will exhibit his acrylic paintings in “People and Their Activities” at Sinsinawa Art Gallery Jan. 6-31. 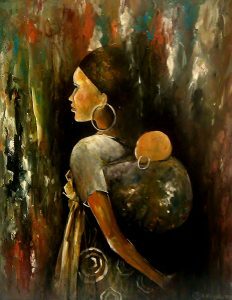 A self-taught artist, Mngodo uses color and negative space to create an emotional feeling in each painting. His abstract, hard-line paintings draw the viewer in. Mngodo’s paintings reflect his origin and are filled with the colors and lights that fill his memory. An opening reception will be held 6-8 p.m. Friday, Jan. 8. For more information, contact Michelle Till at 608-748-4411 or visit our website at www.sinsinawa.org. Sinsinawa Mound, the Motherhouse for the Sinsinawa Dominican Sisters, is located in southwest Wisconsin on County Road Z, off Highway 11, about five miles northeast of Dubuque.